Fishy goings-on on the beach? A marine charity says research must be carried out to discover the reason for a huge increase in jellyfish numbers this summer. The huge barrel jellyfish has been seen on the Fleetwood, St Annes and Lytham beaches throughout the warm months. Now the Marine Conservation Society says the rise in jellyfish in UK waters can no longer be ignored. 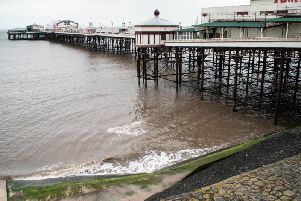 The organisation is calling for more monitoring and research to discover what the increase tells us about the condition of the sea. Dr Peter Richardson, from the society ,said: “Our National Jellyfish Survey suggests significant recent rises in the numbers of some jellyfish species in UK seas, most notably the barrel. Last year there were 1,400 jellyfish reports, and by July this year the survey had already received over 1,000 reports. August is usually a peak month for jellyfish sightings and so 2015 looks set to be another record breaker. More than three quarters of the sightings are of barrel jellyfish. Dr Richardson said: “We know that our seas are changing through climate change, resulting in rising sea temperatures and increased ocean acidification, and we know our seas are also heavily fished. “At the same time we seem to be witnessing increases in jellyfish around the UK.